We sell and ship Billy Goat Truck Loader - Debris Loader Parts! Leaf removal and yard cleanup constitutes a large percentage of a professional landscaper’s income during the fall months. It is important to be equipped with the right tools to maximize efficiency and performance for maximum profit. The TR Series and the HTR are built to fill that vacancy and give landscapers a hardworking efficient machine for the job. There are several models built for different sized job requirements ranging from 11 HP to 18 HP. The TR Series debris truck loaders are a perfect choice for small to medium sized jobs. Their overall low cost and lightweight design make them an economical option yet powerful enough to be a large asset to any landscaper. A Briggs and Stratton Intek or Honda GX engine powers the 4 blade, 14 ¼ inch diameter armor plated impeller made of ¼ inch steel creates over 2,000 CFM vacuuming wet or dry leaves. 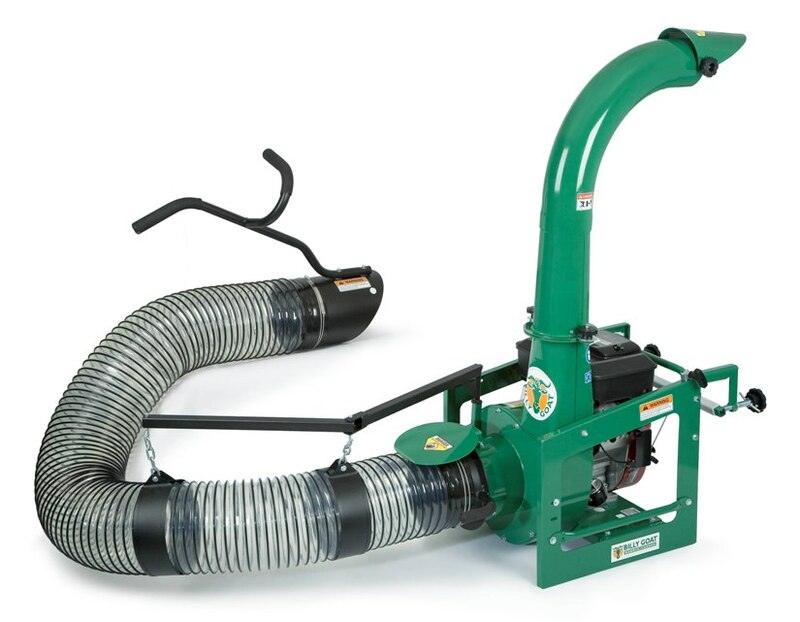 The heavy-duty 8 inch intake hose is clear allowing you to see your work and find clogs or obstructions. For medium to larger sized jobs Billy Goat’s HTR1803 is built to fill the role. Considered a heavy-duty debris loader, the HTR has a larger housing, larger diameter hose and a thicker impeller than the TR Series. Powered by a Briggs Vanguard or a Honda engine, the debris truck loader can perform up to 3,200 CFMs. The 4 bladed impeller is made of 3/8 inch steel and is 16 inches in diameter. The 6 inch exhaust/discharge chute made of 14-gauge steel swivels 360® discharging debris in any needed direction. Both the TR Series and the HTR share some of the same features. The frame and the impeller housing are both constructed of 12-gauge steel. The housing is reinforced with a welded 10-gauge steel liner to withstand wear in high abrasive areas. A hinged steel bar supports the 8 inch (TR Series) or 10 inch (HTR) heavy-duty urethane intake hose. This unique online parts lookup tool helps to find the replacement parts you need to maintain your Billy Goat TR or HTR debris loader. BillyGoatParts.com is a full service authorized Billy Goat dealer with OEM replacement parts in stock.